It's time for another round of Stitch Fix! After my first fix, I decided to go for it two more times before we move. This is round two, and I'm already excited for round three in a few weeks! Don't know what Stitch Fix is? It's a program that sets you up with a personal stylist who looks over your style survey and checks out your pinterest style boards and such to get a feel for your style. Then, based off of your surveyed preferences, they pick 5 items that they think you'd love, put them in a box, and mail them right to your door step. There is a $20 fee which can be used towards your purchases if you choose to keep any of the items. Whatever items you don't want or don't like, you put back in the mail and ship them back for free. Pretty simple. Also, with each "fix" you are instructed to report back on each item: what you liked, what you didn't like, and then you can make some adjustments and schedule your next Fix! 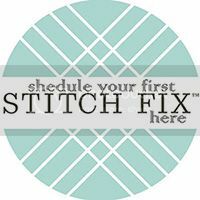 Schedule your first fix here! pps. Yes, you read that right. My mom signed up for her first fix! She gets it on Monday. I'm so excited for her to try it out ;) Maybe I'll convince her to take pictures so I can post her first "fix" here. Fun! OK. On to my second Fix. You guys. My personal stylist knows me. When I opened my box of items, I thought, "this is the box when I keep them all"
Sidenote: if you keep all 5 of your items, you get another 25% discount on the items! The patterns and colors were so "me." It was really late at night when I got home and received my box, but I just couldn't wait until morning to try them on. It was then that I learned, sadly, I wouldn't be keeping all five. The biggest reason for this was fit (I need to do a little more adjusting to my size profile). First things first: I want to point out that the large circle in my jeans pocket is NOT a can of skoal, although this country outfit might lead you to believe otherwise. It's my lens cap people! But wow. That really couldn't have worked out more perfectly. My first two items are this polka dot chambray top and these bootcut jeans. Wade loved this because I looked country in the outfit. He is from Alabama, afterall. Pros: I loved the dots and the chambray, obviously. Cons: It was too big in the chest (which I tried to mask by tucking it in, which just made me look like a country bumpkin) and the cut wasn't the typical chambray top cut. It was cut more like a dress shirt where it flares out at the bottom. Not my favorite cut for a shirt. Things that accentuate the hips = no bueno. Pros: The dark color was great and they were pretty stretchy - always a jeans plus in my book. Cons: I'm just not a fan of bootcut. I'm sure I will be again one day, but for now I prefer straight leg or a skinny ankle. Also, they were tight in the thigh area, even though they fit great in the waist. Pros: um, I LOVE IT. Is that enough of a "pro" for you? I love the cut, the style, and the color. It fit great and I felt great in it. Cons: I have a dress that is almost exactly like this. (I really wish I could make one of those iPone blushing emoticons right now). The dress I have is mostly blue like this and has some stripes up top but the bottom is solid blue and then solid green. But the cut is identical. I really went back and forth on this one because of this, until Wade reminded me that I also have a good number of shirts that are the same cut but different colors/patterns and that's never bothered me. Good point, hubby. Good point. Pros: Print, color, shape, material, price. Basically everything. Remember when I said Wade pointed out my love of a certain type of shirt in many colors/patterns? This is it. I love sleeveless sheer tops (with or without collars) and I didn't have a pattern or color like this (until now!) Also, I love pattern mixing, and feel like this is a great top for that -- hence my tribal sweater in the photo on the right. Cons: I probably could have gone down a size, but that's just being nit-picky. Pros: I loved the color and the style (see my favorite shirt style explanation above) and the lace cut outs. Cons: too big. *sad face* Also, for the price I just didn't feel like it was worth keeping since I wasn't just in love with it. Verdict: Sent it back. But this one was a toughy. I went back and forth on it quite a bit. What were your favorite pieces from my "fix"? Do you think I kept the right items? Which ones would you have kept? tagged with Stitch Fix, fashion?